Today I went thrift store shopping with my friend James. We hit the three large thrift stores in Virginia Beach, Goodwill, Salvation Army, and the DAV thrift. My big goal for today was to find more sweaters to frog, but none of the stores had any winter wear out yet. I guess this makes sense since it is summer and no one is buying sweaters, but I am used to Kentucky where the thrift stores carry sweaters year round. 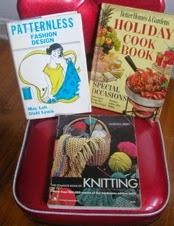 I decided instead to focus on the vintage cookbooks (only 1950-1959) and vintage craft books (1960-1973). In the first store I found Patternless Fashion Design (1968) which is a sewing book focused on designing clothes based on measurements.Since I can't stand patterns I already do this, but I am not very good at sleeves and inseams; I am hoping this book will help me work through that. Another great find was the Better Homes & Gardens Holiday Cook Book (1959). The highlight of this book is the section on throwing a luau Trader Vic style and the "tempting buffets from India and Mexico." I am not sure what India and Mexico have in common, but it made for a fun couple of pages. The last book I bought was The Complete Book of Knitting. It doesn't look like anything special from the outside, but is is surprisingly full of information. In addition to the typical how to knit and basic techniques, it also contains 200 stitch patterns and a section on reading patterns in several other languages. The next two thrift stores were short on craft books, but contained lots of craft supplies. The Goodwill had tons of knit kits, but they were pretty basic so I left them for someone else to discover. Instead I bought a Oscar the Grouch needle point kit from 1972. I don't actually do needle point, but the kit was a dollar and James convinced me that it would be easy. Then we moved on to the DAV thrift where the craft section was overflowing with yarn, notions, sewing patterns, and needlepoint books. Everything was bagged so if you wanted one ball of yarn you had to buy the bag it was in containing several other balls that you might not need. This is an annoying thrift store practice and I wish it would stop. Anyway I ended up buying a bag of yarn (it's used so it doesn't go against my yarn fast, at least that's what I'm telling myself). 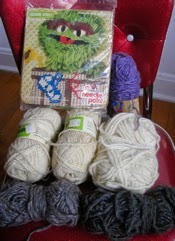 I need to measure and wash the skeins, but I think I am going to dye the white and then make a big bag with these. I'll keep you posted. 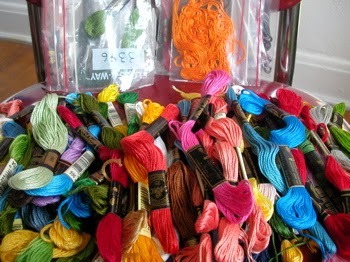 You are looking at 69 full and 38 partial skeins of embroidery floss along with 8 embroidery needles all for $1.98. This is pretty much a lifetime supply for me and I plan on putting it to good use as soon as possible. After thrift store shopping we stopped by PF Chang's for lunch and then went to the Asian grocery where I bought lots of fresh tofu, some basil and Mah Jongg. Now I'm off to Jackie's for a girls night staring Madonna. Great score! I am rarely so lucky these days, and I miss those times where I could walk away with a great score for not so much money. NYC is not such a good place for thrift, I think. But I still love going to the grocery -- two days ago I visited the Bangkok grocery and picked up such great things: fresh thai produce such as kaffir lime leaf, lemongrass, galangal, thai basil and things like mock duck in a can (i'm definitely intrigued), chili powder, roasted rice powder, and fat rice noodles! Yeah, I gave up on the idea of thrifting in NYC a few years ago after an entire day with no scores. The best thrift stores seem to be in big towns and small cities so that is where I focus my energy. Have you checked out some of the Saturday fleas? I did find lots of great stuff at the 26th Street flea once. Not in a while (the Saturday fleas), though some times they are pretty good. My best and most recent finds (mostly for clothes) have been in Kalamazoo, MI (where my sister lives).